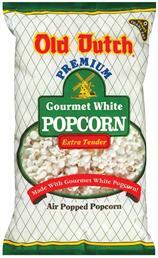 Old Dutch Premium Gourmet Popcorn is a snack favorite that we're sure you'll love. We use only a special snow-white premium popcorn that's bred for extra-tenderness. Air-popped, tender and delicious, Old Dutch Popcorn is a special treat. And our Cheese Popcorns!! The favorites of consumers throughout the Upper Midwest, Old Dutch Cheese Popcorn or White Cheddar Popcorn with rich, creamy cheese flavor beyond compare!